First Car Rental Hatfield new location: 1071 Stanza Bopape Street, Hatfield, Pretoria. April 2019 - First Car Rental's Hatfield branch in Pretoria has moved to 1017 Stanza Bopape Street (Church Street), Hatfield, Pretoria, just 1.7 kms away from its previous location at 1270 Stanza Bopape Street. 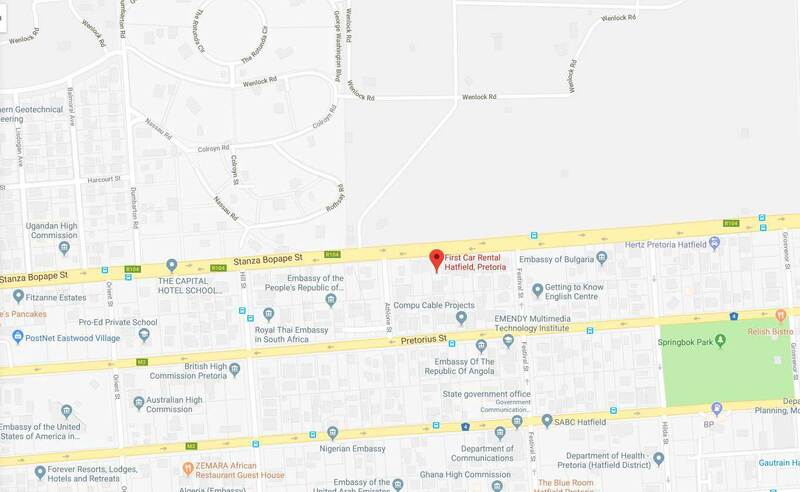 Directions: Travelling on Stanza Bopape Street away from the City centre, First Car Rental is situated on the right opposite the Presidential Guest House Estate. Look for First Car Rental signs. Our Hatfield branch is on the Gautrain H3 bus route. Use Stop H3-2 Church St and Festival St.
Hatfield lies in the heart of Pretoria, just outside the city centre between Arcadia and Lynnwood. A serene suburb, Hatfield is home to one of the major campuses of the University of Pretoria and has a high density of students. Hatfield is also known to be the embassy suburb, because of the number of embassies that have moved into large houses in the area. Don't let the conservative appearance of this suburb fool you. Hatfield has a burgeoning business area and has several restaurants, shops and entertainment and attractions that make it a great destination for anyone who loves good food, a vibrant atmosphere, great shopping and a buzzing nightlife. Duncan Yard is a boutique lifestyle centre, where you discover quaint stores and eateries along cobbled stone walkways and castle turrets, reminiscent of a rustic Italian village. The open air centre provides a unique shopping experience with over 15 restaurants and shops, as well as a selection of stores offering boutique clothing, jewellery, decor, florists and hair and beauty salons. The lifestyle centre is also renowned for the popular Papa's Real Food restaurant and the Deli on Duncan's delectable array of delicacies. The Ditsong National Museum is one of the largest and most impressive natural history museums in South Africa. The museum houses many collections in various fields including cultural history, geology, military history, archaeology, palaeontology, flora and fauna and anthropology. Visitors can view actual skeletons, skins, fossils and other historical wonders locked in time. If animals are what interest you, then the massive dinosaur and whale skeletons will certainly impress. 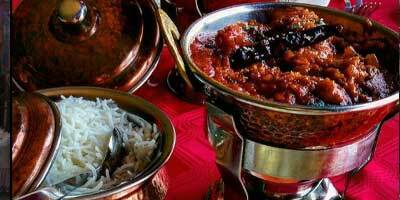 If you have a hankering for Indian cuisine, Namaskar offers an exquisite range of Indian dishes created with fragrant spices that will get your mouth watering. The sophisticated restaurant, draped in bold decor and plush yellow, red, and green interiors with dark mahogany and saffron touch on the upholstery, evokes the feel and spirit of the magical land that is India. The restaurant boasts of superb food, warm and personal hospitality, and stimulating atmosphere. Built in 1986 before the start of the second Anglo-Boer war, the majestic Fort Klapperkop is situated in Groenkloof in Pretoria. Now restored to its original state, this fort is one of the best examples of the 19th century weaponry defences in the world. This outstanding fort houses an incredible museum displaying artefacts, rifles and furniture found and used during the war. Widely known as the Pretoria Zoo, the National Zoological Gardens in Boom Street is the largest zoo in South Africa and the only one with national status. The 85 hectare zoo attracts 600 000 visitors every year. National Zoological Gardens is a facility of National Research Foundation and plays an important role in the conservation and protection of threatened species. The Zoo is home to 3117 animals and boasts of having the largest inland marine aquarium and the third largest collection of exotic trees in the country. Book a car with First Car Rental to explore the amazing attractions in Hatfield, Pretoria.